zooplus will benefit form the shift from offline to online. zooplus will benefit from the premiumization and humanization of pet food. zooplus operates in 30 countries across Europe. zooplus has a 94 percent retention rate among consumer. While reading the books, I was fascinated by the phenomenon of domestication of animals. As an investor, I am always looking for opportunities to become an owner in companies that can improve customer’s life or bring benefit to the world. After listening to a fascinating podcast with Connor Leonard and Patrick O’Shaughnessy, I found out about zooplus, an online retailer of pet supplies in Europe. zooplus (OCT: ZLPSF) (OTC: ZOPLY) (ETR: ZO1) is the market leader in online pet supplies in Europe with customers across 30 different countries. It has roughly 8 000 different foods and accessories for dogs, cats, small pets, fishes and horses. Although zooplus is the market leader in online pet supplies in Europe, it still has a lot of room for growth. zooplus has achieved 50% market share in the online retail segment which compromises about 7 to 8% of the total market. I believe the online market penetration will continue to grow in the future and zooplus will benefit from this trend. I believe that pet owners will use zooplus and other online pet food suppliers to streamline their purchases of food for their pets. Because pet food is something that doesn’t change, streamlining the process will be an advantage for the owners since it takes less time to order the food online than going to a brick and mortar store. 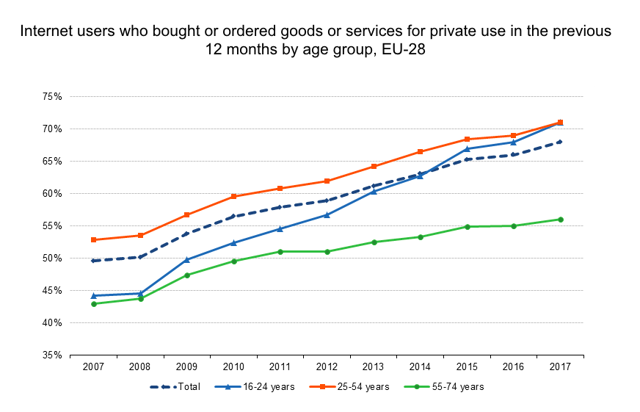 As you can see from the graph, more and more of the European Union population are buying goods and services online. This is wonderful for zooplus that more people are buying online because it helps them increase their market share. 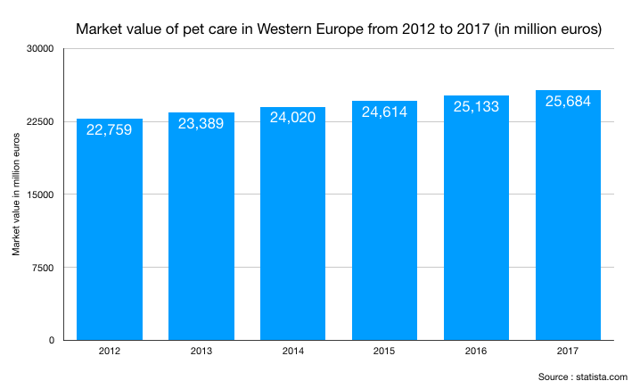 Not only more purchases are made online for pet supplies in the recent years, but also the market value of pet care has been growing year by year in Europe. zooplus operates in 30 countries across Europe and has seven fulfillment centres located in the centre of Europe which enables the company to be fast and efficient when delivering products to its customers. zooplus has this fulfillment centre located in four of its biggest market and one located in the United Kingdom which is a big market for pet supplies. I believe it will be hard for the competing companies to compete with zooplus especially brick and mortar, notional operators, and regional operators because opening a fulfillment centre requires a lot of capital investment. Plus, zooplus offers a wider variety of product compared to its competitions. According to the company, large-scale supermarket and discounters usually limit themselves to a product rage of approximately 150 – 200. This is nothing to the roughly 8 000 different foods and accessories offered by zooplus. One of the biggest advantage zooplus has over its competitor is their customers. zooplus, as of November 15th, 2017, has around 6 million active customers and has been adding more customers every year. Repeat customers sales during the first nine months of 2017 have been 94% of their sales. It is incredible that the company can maintain customers at a rate of over 90% since 2014. According to the company, their customers helped to acquire new customers through word-of-mouth recommendations. And, I believe there is nothing more powerful than word-of-mouth advertisement. zooplus has much competition from the mom and pop stores, regional retailers, national retailers, and the Goliath Amazon which also sells pet food and pet accessories. Amazon has recently entered Spain and Italy with full pet supplies assortments. These two markets are very important to zooplus because they are one of the biggest markets in Europe. I believe zooplus is an excellent company and has a great future ahead if it continues to grow its market share and if it can maintain the high percentage retention rate among consumer. I do not currently own shares of zooplus for two simple reasons: I do not know if I should hedge the currency when I am buying shares of the company and if I should buy it over-the-counter in the US market or directly from the German stock exchange. All stock recommendations and comments are my opinions. Investors should be cautious about any and all stock recommendations. All investors are advised to conduct their own independent research into individual stocks before making a purchase decision. In addition, investors are advised that past stock performance is no guarantee of future price appreciation.